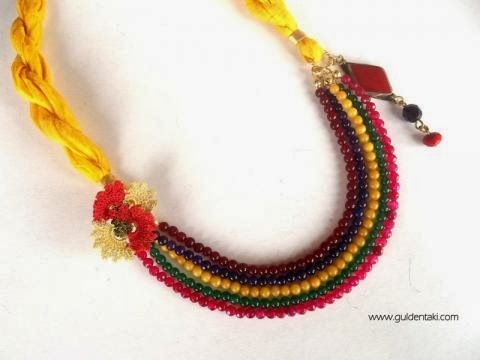 This is multi color semi precious stone necklace with yellow silk fabric and needle lace. This necklace is a wonderful gift to yourself or to your loved one. The necklace is handmade jewelry. This necklace is authentic jewelry. 5 aligned semi precious stone. A gorgeous mixture of dark reds, purples, yellows, greens and fuchsia.